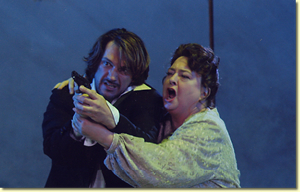 "An impeccable cast....the only one to really master her text from beginning to end was the impressive American mezzo Eugenie Grunewald, whose rich timbre and strength of conviction were a marvel in the character of the Mother." 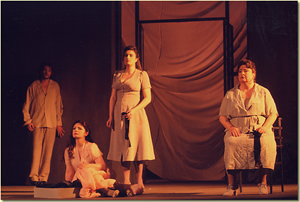 "Eugenie Grunewald (as the Mother) stands out as the most astonishing singer from the cast, not only because of her impeccable diction in English that makes each word she sings absolutely crystal clear..........But, above all the (commanding) inwardness and intensity with which the singer invests her interpretation does full justice to the character's psychological depth." 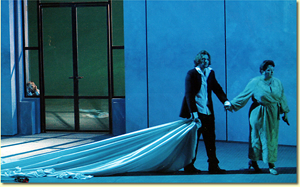 "The jealous guardian Mother sung by the magnificent Mezzo Soprano Eugenie Grunewald personified the last line 'Come - you're free now'........."
" Eugenie Grunewald brought out in the Mother the depth and grandeur of the character. 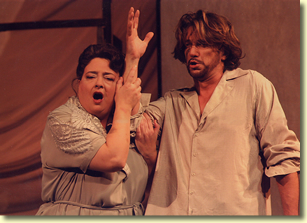 This Mezzo Soprano possesses so much in terms of voice and soul." "A beautiful performance from Eugenie Grunewald......."
"Eugénie Grünewald made a fearsome mother, her pungent mezzo biting into the text with animal relish." 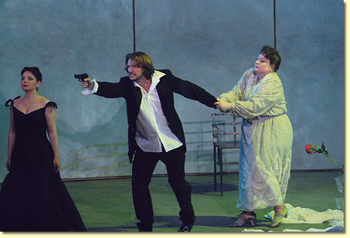 "Dontao is blind: he and Maria fall in love, and he is tormented by fits of jealousy, but marital and filial obligations ultimately take precedence, with the formidable presence of Donato's mother as a strong counterweight. Eugenie Grunewald's Mother caught the despair beneath the authoritative front.............."